The GSIS offers various retirement programs depending on the qualifications of the member. GSIS has retirement packages generally acknowledged to be one of the most generous in the country-ensuring financial freedom for its members, especially after they leave the service. Also called “Magic 87”, this option provides both annuity and lifetime pension. The retiree’s last three years of service prior to retirement should have been continuous, except in cases of death, disability, abolition, and phase- out of position due to reorganization. He/she should meet the age and service requirements under the “Magic 87” formula. Based on the formula, a retiree’s age and years in service should be added up and should total at least 87. The maximum monthly pension for those above 57 years old shall be 80% of the Average Monthly Salary (AMS) received during the last 3 years immediately preceding retirement. The Maximum pension for those aged 57 and below shall be 75% of the AMS. Option 1: Automatic Pension – Under this option, pensioners below 60 years old may choose to receive either an automatic monthly pension for life or an option to avail of a lump sum. The lump sum, which can be requested every six months, means they can receive their one-year worth of monthly pension in advance for a period of five years. On the sixth year, they will start receiving their lifetime monthly pension. Option 2: Initial three-year lump sum – For those who are at least 60 years old but less than 63 years on date of retirement, the benefit is a 3-year lump sum. The subsequent two -year lump-sum shall be paid to the retiree on his 63rd birthday. If the retiree is still living after the 5-year guaranteed period, he shall be entitled to a monthly pension for life. Option 3: 5-Year Lumpsum – For those who are 63-65 years old, they can avail of a five-year lump sum then after five years, they will receive a monthly pension for life. Retirement under PD 1146 can only be availed by those who were in service after May 31,1977 but prior to June 24, 1997. A retiring member under PD 1146 is entitled to either Old Age Pension or Cash Payment, depending on his age and years in service. This option is available for retirees who are at least 60 years old and have rendered 15 years of service. Those qualified under this option will receive a Basic Monthly Pension (BMP) guaranteed for five (5) years. After the 5-year guaranteed period, he/she will receive a basic monthly pension for life. A retiree may also request to convert his/her five-year guaranteed BMP into a lump sum subject to a six (6) percent discount rate. In either case, the BMP shall not exceed 90% of the Average Monthly Compensation (AMC). This option is available to retirees who are at least 60 years old and have rendered at least 3 years but less than 15 years of service. Qualified under this mode option will receive a cash payment that is equal to 100% of the Average Monthly Compensation (AMC) for every year of service. Five-year lump sum or cash payment with instant pension-choose your personal reward. When availing of the retirement program under RA 8291, two things should be considered: age and the length of service. The retiree must have rendered at least 15 years of service and must be at least 60 years of age upon retirement. He /she must not be a permanent total disability pensioner. Under this option, the retiree can get his/her five-year worth of pension in advance. The lump sum is equivalent to 60 months of the Basic Monthly Pension (BMP) payable at the time of retirement. After five years, the retiree will start receiving his/her monthly pension. In option 2, the retiree will receive a Cash Payment equivalent to 18 times the Basic Monthly Pension (BMP) payable upon retirement and then a monthly pension for life payable immediately after his retirement date. The BMP, however, shall NOT exceed 90% of the Average Monthly Compensation (AMC). The maximum amount of the Average Monthly Compensation (AMC) to be used as the base for computing pensions and other benefits of a member shall be the AMC limit prevailing at the time the contingency/ies occurred. Thus, pursuant to the lifting of the AMC limit, the monthly pension of a member with at least 15 years of creditable service who is in the service on or after January 1, 2003 shall be computed on the basis of his/her AMCs without limit. Refund your GSIS premiums with this “take-all” option at the same time get gratuity payment from your employer. RA 1616 provides for a gratuity benefit for retiring members who will qualify under this retirement mode. The gratuity is payable by the last employer. The employee shall also be entitled to a Refund of Retirement Premiums paid, personal share with interest and government share without interest. His/her last 3 years of service prior to retirement must be continuous, except in cases of death, disability, abolition or phase out of position due to reorganization. 2. Refund of retirement premiums consisting of personal contributions of the employee plus interest, and government share without interest, payable by the GSIS. Combine your GSIS and SSS creditable years of service to qualify for retirement program offered by both pension funds. Admittedly most of us move from one job to another in a move to find a higher pay and better career. Many government retirees have had a history in the private sector. In certain cases, they don’t have enough years of service in the government to qualify to any GSIS retirement program. With the help of RA 7699, otherwise known as the Portability Law, government retirees who do not meet the required number of years provided under PD 1146 and RA 8291 can still avail of retirement and other benefits. Under the scheme, you may combine your years of service in the private sector represented by your contributions to the Social Security System (SSS) with your government service and contributions to the GSIS to satisfy the required years of service under PD 1146 and RA 8291. However, if you have satisfied the required years of service under the GSIS retirement option you have chosen, you would not be allowed to incorporate your contributions to the SSS anymore for availment of additional benefits. In case of death, disability and old age, the periods of creditable services or contributions to the SSS and GSIS shall be summed up to entitle you to receive the benefits under either PD 1146 or RA 8291. If qualified under RA 8291, all the benefits shall apply EXCEPT the cash payment. The reason for this is that the Portability Law or RA 7699 provides that only benefits common to both Systems (GSIS and SSS) shall be paid. Cash payment is NOT included in the benefits provided by the SSS. 1. A member can only avail of one retirement mode. His election of a mode of retirement precludes him from retiring under other retirement laws. a. The optional policy shall be under the terms and conditions of the optional life policy program of GSIS which may not necessarily be the same terms and conditions of the member’s original compulsory life policy. b. The premium rates to be paid by the member concerned shall be in accordance with the scheduled premium rates under the optional life policy program of GSIS and the age of the said member at the time he/she elected to convert. 4. The retiree-pensioner is required to report personally to the GSIS nearest his/her place of residence at least once a year and at such time as may be determined by GSIS as a condition for continued remittance of his/her monthly pension. I was a teacher for nine years. After graduation in 1968, got a teaching position with the DIVISON of RIZAL. Five years service BPS DIVISION OF RIZAL and four years BPS DIVISION OF MANILA until I resigned in 1977. 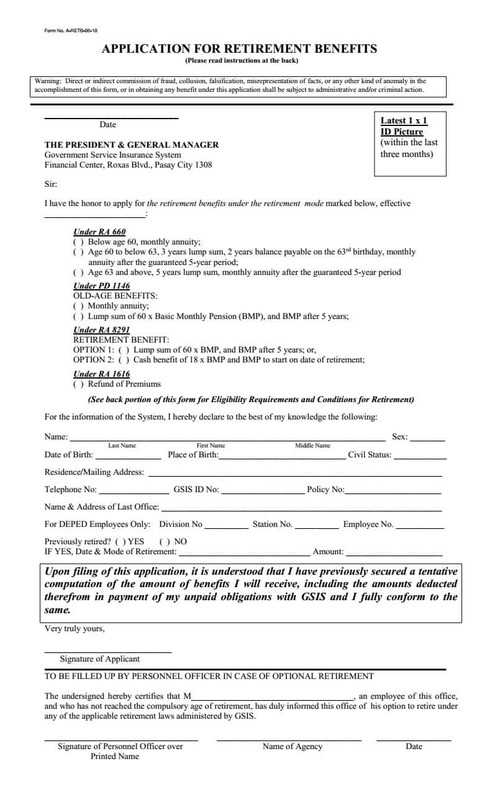 I wanted to apply for a retirement benefit under GSIS but not sure which one to complete. is it too late to apply? I appreciate if someone is able to assist me in the completion of a correct application form? I have a question. Sir, my mom was a special ed teaccher in cebu… she was a teacher for 15 plus years.. she passed away suddenly a couple of years ago… would she be entitled to any government benefits?? Great information and very usefull, thank you.